Eidos Montreal has responded to player complaints by making Human Revolution's new boss battle more like the game that surrounds it. 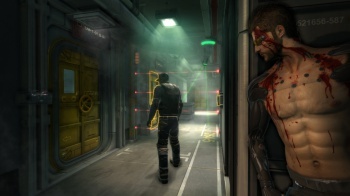 One of the defining aspects of Deus Ex: Human Revolution's highly enjoyable gameplay is the astounding amount of options afforded to the player in completing the game's various complex missions. Such choice was not the case with the game's boss battles, however, immediately earning the ire of many gamers for focusing primarily on combat, not the path many had chosen for Adam's augmentation. Eidos's subsequent explanation that the bosses had been farmed out to another company may have given rise to a collective "ohhhhh" from the gaming community, but still didn't make things any better. With five-hour-long The Missing Link, Deus Ex: HR's first batch of DLC, on its way next month, many are wondering if we'll be dealing with more of the same issues in taking on the main game's big bads. Fortunately, this is not the case, according to Marc-Andre Dufort, the DLC's producer. "We have a boss battle at the end," he said during an interview with Eurogamer, "but it's different from the main game boss battles. You can actually not kill the boss. You can do a non-lethal takedown on him. And you can kill him from afar. You can even kill him without him seeing you. It's more of a bigger challenge than a standard boss fight like we have in many games." Even better, Eidos Montreal will be handling things itself to make sure that things play out like they're supposed to. "Everything was done in Montreal at Eidos," Dufort explained. "It's a lot less frustrating. But it depends on the way you play. If you played more combat in the main game, you probably didn't have any trouble dealing with the boss fights. So, we allow the adaptation of the way you play for that particular boss fight." I think that aside from the difficulty curve, many people found issue with the bosses of Deus Ex: HR because they felt so different from the rest of the experience. Being locked in a small room with a guy twice your size wielding a rocket launcher seems completely counter to the way you probably got there. Though The Missing Link's change seems mainly focused on tempering the difficulty curve, it also sounds as though it will address this consistency issue as well. Regardless, considering the fact that Eidos Montreal was responsible for all of the stellar parts of Deus Ex:HR, we shouldn't be surprised if The Missing Link is just as good.